When an author plunges into background information and themes for his stories, as I did while writing my upcoming novella Conjure Woman’s Cat, it doesn’t take long to discover mythic characters. John the Conqueror is perhaps the king of conjure, looming larger than life through blues songs, stories, root doctor herbal books, and an oral tradition dating back prior to the Civil War. 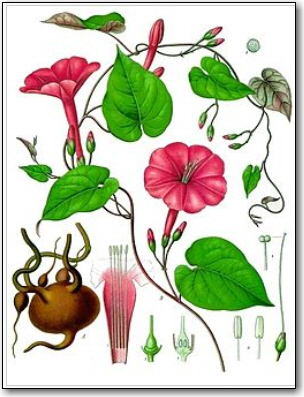 The much sought after High John root, Ipomoea jalapa, is thought to create sexual power. Southern John, from the Wake Robin, Trillium grandiflorum, used in medicine under the name Birth Root to facilitate childbirth and reduce menstrual cramps, is used in folk magic to solve family problems and love issues. Chewing John (AKA Court Case Root) is Galangal, Alpinia galangal, used in medicine to reduce stomach ache and in folk magic to help a client prevail in court. For information about spells, check here on the Lucky Mojo site. Charles W. Chesnutt’s 1899 book The Conjure Woman taught mainstream audiences about conjure in a fashion similar to the way Alan Lomax’s books taught them about true country music. Chesnutt collected stories. Lomax collected folk songs. Whether they trusted them or feared them, African Americans’ awareness of conjure women pre-dates slavery in America. Most White people knew little about the myths and practices of conjure before Chesnutt–and later, Harry Middleton Hyatt and Zora Neale Hurston–collected stories and put them into print. Oral stories about John the Conqueror fed on themselves and on the hope such tales brought to slaves. Hurston brought the myth into the modern day when she wrote, in a 1943 “American Mercury” article, “So the brother in black offers to these United States the source of courage that endures, and laughter. High John de Conquer. If the news from overseas reads bad, if the nation inside seems like it is stuck in the Tar Baby, listen hard, and you will hear High John de Conquer treading on his singing-drum. You will know then, that no matter how bad things look now, it will be worse for those who seek to oppress us…. White America, take a laugh from out of our black mouths, and win! We give you High John de Conquer.” The article is available in PDF. As an author, I think it’s important to keep the old stories alive, whether they’re about King Arthur, John the Conqueror or Joel Chandler Harris’s Uncle Remus stories. They’re part of our culture and our history. Today, I suppose, most of the John the Conqueror focus is on the three roots and the qualities they have in the lore of folk magic. I’m a novelist and don’t purport to be an anthropologist, much less a collector of myths and folktales. When we write ethically, the research we discover while planning a story isn’t pasted into the work like background music in an elevator. It helps shape the story and make it real. I’ll leave the theories to others and focus on storytelling with as much tradition as I can discover–and that includes John the Conqueror. Malcolm R. Campbell’s novella, Conjure Woman’s Cat, will be released in March 2015 by Thomas-Jacob Publishing. You may also enjoy all three of his “conjure and crime” novels in one e-book.